At Bob Evans Restaurants providing wholesome, flavorful meals that bring families and friends together is a symbol of love. From our seasonal ingredients, Eggs gathered fresh daily, Breads baked fresh in house every day, to our dinners slow-roasted for hours. It’s not complicated. Enjoy at our table or yours as this is mealtime! Purchase, use or acceptance of this card constitutes acceptance of the following terms: Once activated, card is redeemable for food, beverage, merchandise and gratuity at any Bob Evans® Restaurant. Card’s face value is in U.S. dollars. Card is not refundable and cannot be redeemed for cash except as required by law. This card has no expiration date and no fees. Not replaceable if lost, stolen, damaged or used without authorization. Resale prohibited. For balance inquiries: check your receipt, visit www.bobevans.com or call 1-866-249-9087. 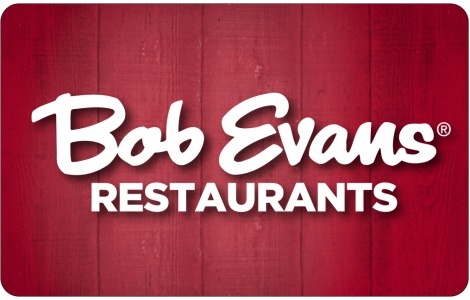 To reload value to this card, visit www.bobevans.com or any Bob Evans Restaurant. Issued by and represents an obligation solely of BER Gift Cards, LLC.